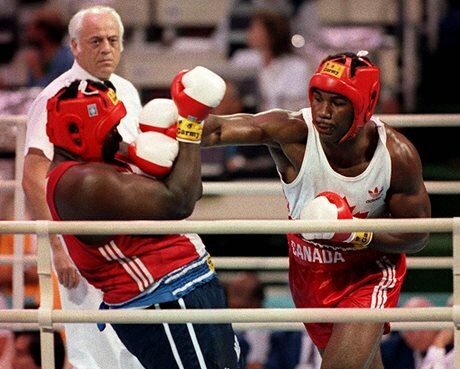 Heavyweight champion Lennox Lewis won the gold medal for Canada in boxing at the 1988 Summer Olympics in Seoul, South Korea – Canada’s first boxing gold since 1932. Lewis moved from England with his Jamaican parents to Kitchener, Ontario in 1977. He started training as a boxer at a young age and won the Junior World Super-Heavyweight Champion title in 1983. The following year, he represented Canada as a super-heavyweight at the Olympics in Los Angeles. Lewis was a six-time Canadian amateur champion. He won the gold medal in the super-heavyweight division at both the 1986 Commonwealth Games and the 1987 North American Championships. Following his gold medal win in 1988, he turned professional and represented Great Britain (Lewis held dual citizenship). In 44 professional fights, Lewis amassed a record of 41 wins. One of his notable opponents was Mike Tyson, who he knocked out in 2002. Read more about Lewis on the Canada’s Sports Hall of Fame website.